1. Collection of savings of general people. 2. Capital supply to productive purpose. 3. Preserving money as safe custody. 5. Creation of exchange medium. 6. Assist in trade & commerce. 8. Creation of credit & deposits. 11. Information supply & advising. 14. Increasing of govt revenue. 16. Development of living standard. 17. Control of foreign exchange. 19. Creation of loan- deposits. 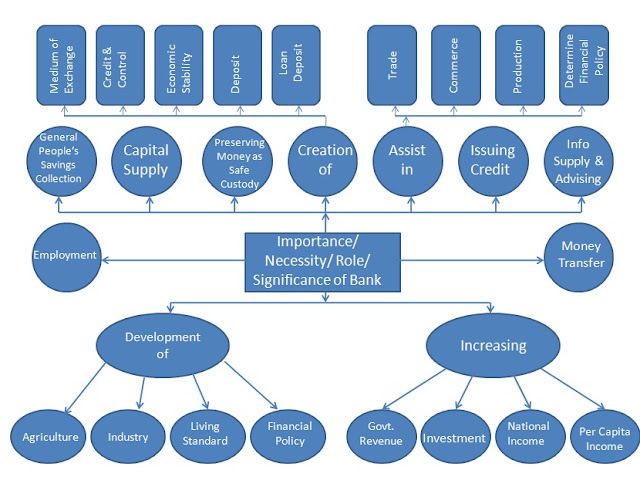 21.Assist to determine financial policy. At last we can say that the significance & functions of modern banks are so enormous that we can't imagine the existence of the present society without banks.